A former college football star was charged with murder after he fired a pistol in the darkened bedroom of his home and the bullet fatally wounded his "best friend" one Saturday night in 1925. George Anderson, 43, a car salesman, was held after the slaying of taxi driver Frank R. McLain Oct. 3 in a 2nd St. house where Anderson lived with an aunt. Anderson claimed the shooting was an accident, but he was held for trial on second degree murder. The victim, 25, was fleet manager of the McLain Yellow Cab agency, and the to men were known as close friends. Anderson had sold a taxi to the McLain firm,nd Albert McLain, Frank's brother, said Frank was to become a partner. Anderson had played outstanding football at Kenyon College, then sold clay working machinery before he became a salesman for the Reo Motor Co. for about 20 months. He had sold his sales contract to the Packard agency. WITNESSES RESIDING in the 2nd St. neighborhood told police the upstairs of the Anderson home was dark, although they saw flickering light as if a person were lighting matches. Then they heard the sound of a gun, and man said, "Oh my God, George, you've shot me," followed by someone exclaiming, "Oh my God, I've killed him." Placed on trial in November, Anderson admitted he was drinking that night. He had been at the firm's garage at Broadway and Railroad St., he said, and discover- ed the keys to his car missing, so he called longtime friend Frank to drive him home. When they arrived at the house of his aunt, Elizabeth Anderson of nd and Jackson Sts., he invited Frank to come in. Frank left the motor of the taxi running, and followed George. Miss Anderson opened the door, and turned on the downstairs lights -- the home not wired upstairs for electricity. Anderson said he went to the first floor kitchen for a drink of water, then headed upstairs with Frank. He then asked Frank to obtain matches to ignite the gas lamps, and went himself to his bedroom. The defendant told the jury he always kept a loaded .45 automatic pistol on his night stand. When he fumbled around on the stand for matches, he knocked the pistol -- trigger cocked, safety off -- onto the floor. He said he picked it up, and as Frank came into the room, "First thing I knew, the gun went off"
The bullet struck McLain in the groin and exited on the left side. He was taken to City Hospital where he died early Sunday morning, about five hours later. His widow and son, Jesse, 3, survived. Assistant Prosecutor Blaine Cochran told the jury of nine men and three women that Anderson's story "did not ring true." Prosecutor Robert Brookes asked the defendant why he kept a cocked, loaded weapon on his night stand. "Was your house ever robbed?" No, Anderson replied, but his previous home had been. Brookes said he knew Anderson as a friend, "I've never had a more difficult case in my life. But I cannot shirk my duty." At his request, Anderson tossed the cocked murder weapon, safety off, onto the courtroom floor, but the hammer did not strike. Defense attorney Frank Grosshans recalled McLain's last words, "We had no quarrel, we were the best of friends." George Farrell, another defense lawyer, said, "There was no intention; there was no manslaughter if he accidentally shot him." But the panel deliberated only an hour and 22 minutes in returning a manslaughter verdict. Through five ballots the vote was 11 to one, and on the sixth the verdict became unanimous. The defense asked for a new trial, citing six errors in law. But Judge J. B. Worley of Cadiz rejected the motion, and sentenced Anderson to from five to 20 years at the Ohio Penitentiary. Anderson's lawyers sought a stay of execution while they filed an appeal, but he was taken to Columbus by Sheriff George Wright on Thanksgiving Day 1925. He still protested the death was an accident, and predicted he would win a retrial and,- acquittal. After serving about four months, he won a new trial ordered by the appeals court, but again he was convicted of manslaughter. Anderson maintained the shooting was an accident -- he was reaching for the matches, stumbled against the dresser and the weapon discharged. HOWEVER, DR. C. H. BAILEY testified, "In order to inflict the wound, the gun must have been held parallel with the top of the dresser and some seven inches above it when it discharged." He said there were no powder burns on the victim's clothing, and the weapon was fired 2 or 21/2 feet from the body, and must have been held in this position practically back of McLain. An indeterminate prison term was ordered, but Atty. Grosshans, filed another appeal in January 1927, and a stay of execution was granted for the Ohio Supreme Court to decide the issue. Anderson had obtained a job as a car salesman at Columbus where he learned March 6 the state court had overruled his appeal for a third trial, directing him to serve the prison term, minus the four months already spent behind bars. When it comes to callused, professional bloodletting, few could surpass a young man who shot his brother to death just east of the East Liverpool city limits and gained a chilling reputation in Midwest crime some 60 years ago. Willis Miller was a frequenter of "Hell's Half Acre" -- that shady little state line neighborhood of 1920-50 -- and a bootlegger who killed his brother and became Pretty Boy Floyd's companion in crime. Miller, originally from Ironton, confronted his brother, Joseph "Alabama Joe" Miller, over a woman in the autumn of 1925 a short distance into Pennsylvania from "The Half-Acre." The slaying earned Willis the nickname "Billy, the Killer" throughout the Midwest. Jake Eckert -- longtime proprietor of the state line tavern and husband of Jennie Eckert -- was a witness to the slaying, according to a newspaper account. Billy, 22, was living in Midland when he and Joe, 29 -- known as the "King of the State Line Bootleggers" -- became infatuated with Mrs. Hazel Campbell Anthony. Jealousy turned to bloodshed Sept. 18. Billy asked Jake if he had seen his girlfriend. Jake replied that Joe Miller and Mrs. Anthony were near a spring up the hill 200 yards east of the Ohio line. Billy and Campbell began walking up abandoned Island Run street car tracks, while Eckert headed toward the spring on a shortcut, planning to alert Joe and Hazel. The bullet hit Joe in the chest, passing through his body. Eckert said he jumped behind a tree to avoid being struck by a stray bullet, and did not see what followed. However, police reported Joe was apparently beaten severely about the head with the handle of the revolver after he fell and rolled into weeds along the path. Police, alerted around 7 p.m., found the body on the path, dragged there by William Llewellyn, operator of a stateline refreshment stand who heard the shot and went up to investigate. City officers along with Pennsylvania law men combed the area for the suspects. Billy, Mrs. Anthony and Campbell reportedly went to Campbell's home, then disappeared. The Miller brothers, according to police, had arrived in this area about three years prior, and were blamed for a number of offenses linked with "Hell's Half Acre." Joe had been released from the Allegheny County (Pa.) Workhouse a month before, serving a year on a liquor charge filed in Beaver County for which he had been fined $1,000. Joe had been sought several months for that violation, making several sensational escapes before he was captured. He had lived at the state line since freed from the workhouse. His younger brother had earned a bad reputation as a youth around Ironton. Billy had returned to the state line area that spring after serving six months in the Allegheny workhouse for a liquor violation. He reportedly had resumed his bootlegging enterprises, and a city illegal liquor charge was filed against him. In June 1925 city Patrolmen Herman Roth and Chester Smith went to the state line looking for Billy, locating him on the Ohio side. When Roth told him he was under arrest, Miller bolted. Roth fired at him, the bullet hitting the suspect in the leg, and he surrendered. Billy was admitted to City Hospital where, eight days later, he escaped, apparently with the help of outsiders, one a woman. He climbed down from a second story window using sheets tied together to form a rope. Police said friends took him to New Castle, Pa., where he recovered from his wound, and went to Midland where he got a job in the mill and took up residence. JUST A FEW days before shooting his brother, Billy indicated he wanted to "go straight," and had almost arranged with police to turn himself in on the liquor charge and pay his fine in installments. 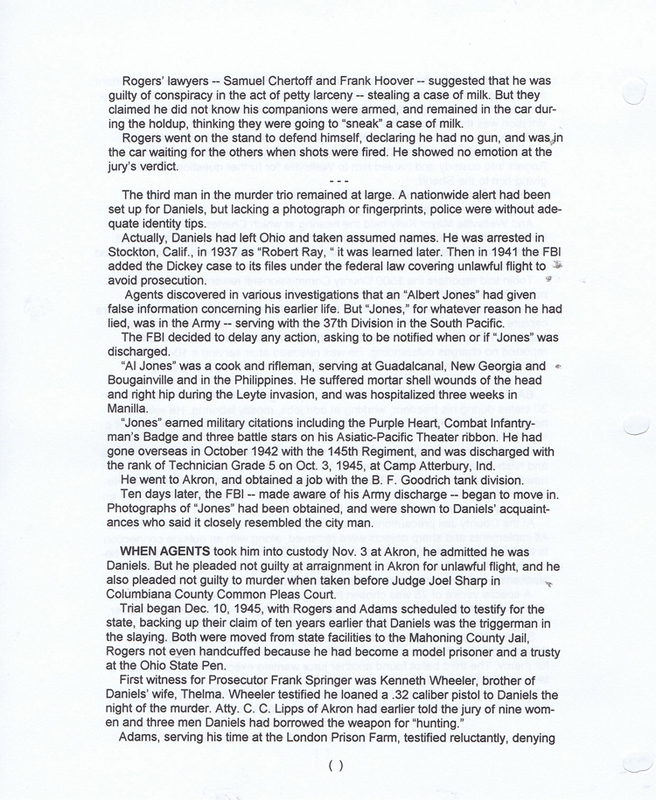 Miller later was tried in Beaver County for first degree murder in connection with his brother's death. He claimed in court he fired his weapon only after Joe attacked him, and the jury returned a not guilty verdict. However, the trial judge ordered him held under an old English law that required a $2,000 bond as guarantee for future good conduct. Unable to raise the money, he spent a year in jail until the bond was reduced to $500. It was posted by his mother who, it was said, mortgaged her home in Ironton. Billy drifted to other parts of Ohio, engaging in illegal activities, but keeping himself out of prison to which he swore he would never return. Six years later Billy himself was slain in a gun battle he and Pretty Boy waged with police at Bowling Green, Ohio. Floyd escaped, but a cop was fatally wounded, Floyd's girlfriend was hit by a bullet and Billy's girlfriend was captured. Young Miller had joined up with Pretty Boy in 1930, not long after Floyd escaped from a train taking him to the Ohio State Prison in Columbus to serve time for a bank holdup in Sylvania. Pretty Boy and his holdup pals had been captured in Akron in a raid in which a policeman was killed. Fugitive Floyd made his way by back roads to Kansas City, where he and Billy Miller became partners. They were seen together in Kansas City and in small Oklahoma oil towns. Glendon Floyd, Pretty Boy's nephew who visited here in 1994 for the 50th anniversary of his uncle's slaying near Sprucevale, is quoted in Michael Wallis' book about Floyd. Glendon recalled that Miller was always rubbing his revolver. He had also refashioned the cylinder of the weapon so the cartridges would not rattle to alert unsuspecting victims. Miller and Floyd along with George Birdwell, a veteran Oklahoma outlaw, held up the bank at Earlsboro, Okla., March 9, 1931, getting away with some $3,000. At Kansas City, Miller and Floyd went to Sadie Ash's boarding house where Floyd had stayed before. It was where he had met Sadie's daughter, Beulah, who, according to Wallis, gave Charles Arthur Floyd the name Pretty Boy. Wallis said Beulah came in the room to serve beer, saw Floyd with a new haircut and spiffy clothes, and sat down beside him, saying, "Hello, pretty boy, where did you come from?" In the winter of 1930, Floyd again was drawn to Beulah, now 21 and married to Sadie's son, Walter. Miller turned his attention to her sister, Rose, wife of another son, William. The Ash brothers were smalltime hoodlums who were also thought to be police informants. Jealous tension naturally sprouted between the Ash boys and the two men who attracted their wives. Soon the two women left their husbands and took their own apartment. After near capture by Kansas City police in a bootleg raid, Floyd sensed someone had snitched on him. In March 1931, Walter and Will Ash were seen in a car racing up a street, chased by another auto holding Pretty Boy and Billy. THE BODIES OF the Ash brothers were found two days later in a ditch in nearby Kansas, bullets through the back of their heads -- a style more Billy's than of Floyd who had not previously been tied to a killing. Floyd with dark-haired Beulah and Billy with Rose left Kansas City for Oklahoma, then traveled through Kentucky and were soon seen in northwest Ohio and southern Michigan. They were suspected of bank jobs in Kentucky and at Whitehouse, Ohio, but were not found. At Bowling Green, Ohio, police became suspicious early in April 1931 about two couples spending large sums of money in various stores for a week or so. The foursome left town, but when on April 16 they reappeared, police were convinced they were casing a bank. Police Chief Carl Galliher and Patrolman Ralph Castner, 28, drove to the bank site, and got out to approach the suspects. Suddenly the two men began to shoot, and the law men scattered, returning fire. Miller was struck in the stomach by three bullets, falling dead after getting off only one shot of his .45 caliber revolver. Patrolman Castner was hit in the abdomen by one of Floyd's shots, and collapsed but continued to fire. One of Floyd's ricocheting bullets hit Beulah in the skull, but Rose was taken into custody unharmed. Floyd kept firing until his gun was empty, then raced down an alley to his car, and drove away. Galliher chased him, but netted only the license plate number. Patrolman Castners wound took his life in a few days. Beulah recovered from her wound, and Rose was released when nothing could be proven against her. Billy Miller, suspected of several robberies and the Ash brothers' murders, had kept his vow never to be taken alive. 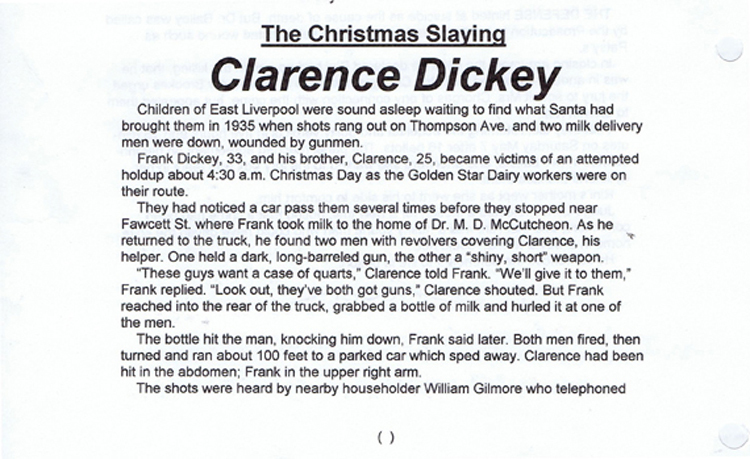 Probably the last evidence of his link to East Liverpool came three years later when Pretty Boy was shot down near Sprucevale, and his body brought to the Sturgis Funeral Home on Fifth St. Among the items in Floyd's pockets were his watch with Billy's lucky 50-cent piece attached to it -- set aside for next-of-kin. The puzzling 1926 death of an itinerant preacher led to discovery that his bride had been wed to at least seven other men, many of whom died suddenly under mysterious circumstances. The Rev. 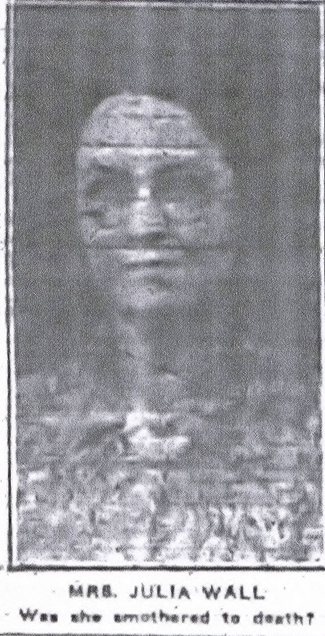 William Christy, 56, of Flint St. in the East End, married only eight days, expired at City Hospital Jan. 14, 1926, in a manner which prompted medical authorities to notify the police. Officers began searching for his wife, Mrs. Laura E. Christy, 48, found about midnight on Sixth St. by Patrolman Howard Lister who said she was walking toward the Newell Bridge. 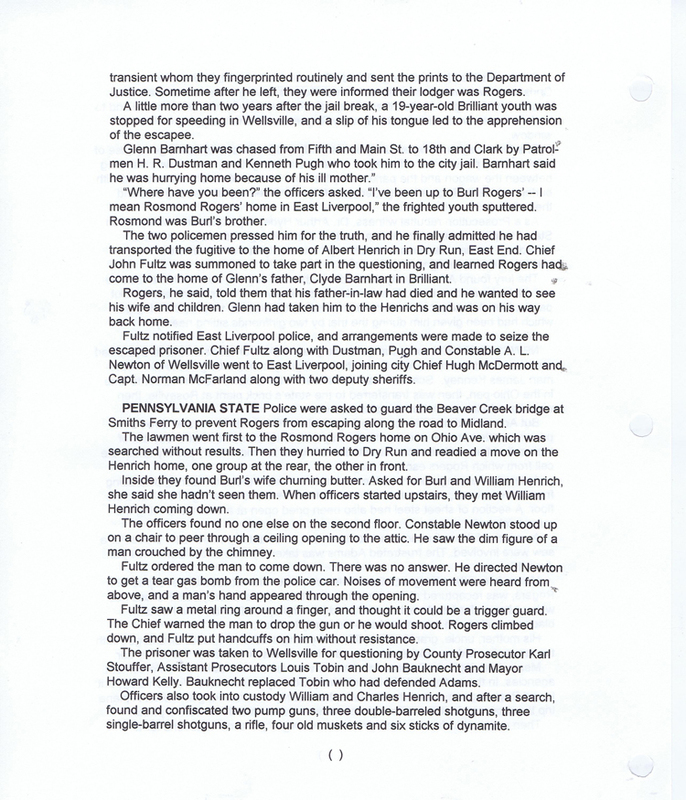 Mrs. Christy was taken to the City Hall where she underwent a two-hour questioning by Police Chief Hugh McDermott, Capt. Mason Conley and Columbiana County Coroner J. M. VanFossan of East Palestine. The nature of the death stirred suspicions along with discovery of withdrawal of money from the Christys' joint account at an East End building and loan firm. Christy, a representative of the United Christian Missionary Association, had taken out $100 from the $400 account earlier in the week, and $200 was withdrawn earlier the day of his demise. CHRISTY AND HIS family had once resided in East Liverpool and Wellsville, and he was living at Akron with his children in 1925 when he met an old friend, George Crawford of Erie St., East End visiting there. Crawford said Christy came here in December, telling him he planned to take up residence in East Liverpool. The minister, Crawford reported, visited his home Jan. 4, and offered his wife $25 if she could find him a wife. Mrs. Crawford went to her cousin, Laura, to report this proposal. Laura and Christy met at the Crawford home that evening, and next day were married. Mrs. Christy, a stout woman with dark hair and dark rimmed spectacles, told officials her husband had a $300 life insurance policy. She also revealed she had been married four times. Two husbands were dead, but her second husband, Frederick Harmon of Athens, NY., was alive. Coroner VanFossan had ordered a post-mortem examination of the body which was taken to the Miller morgue. Although first details of the Christys' relationship were vague -- she said they had been married a week or two, she couldn't remember the date -- it turned out they were wed at Beaver, Pa., Jan. 6 by a retired United Presbyterian minister. She told police they had met only the day before the ceremony, and were living in a two-room house he purchased for $50 in December near the Homer Laughlin Co. pottery. She said the pair had breakfasted on pancakes, fried eggs and coffee at 6 a.m. Tuesday, and he left for downtown to buy her an ironing board. Returning around 10 am., he said he felt ill. She helped him to bed, and applied hot water bag and warm plates to his stomach and chest. She also gave him baking power mixed with water, she said, to relieve his pain. But Christy began vomiting, even after two more doses of the powder, and she became alarmed, trying in vain to obtain help from at least two physicians. When his condition turned worse Wednesday morning around 3, she had the night watchman at the nearby pottery summon the Sturgis ambulance, and her husband was taken to the hospital at 4:30 a.m.
She didn't accompany him, but visited him at 9 a.m., apparently after moving her trunk and suitcase to a room she rented in the Gilbert house on W. Sixth St. in order to be near him during his illness. Dr. A. J. Michels attended the ailing Christy who continued with vomiting spells, and died at 6:20 p.m.
During the police questioning, she said her first husband was Jess Sears, a pottery night watchmen she wed when 18, and lived with on a houseboat. He had died suddenly several years before of natural causes. 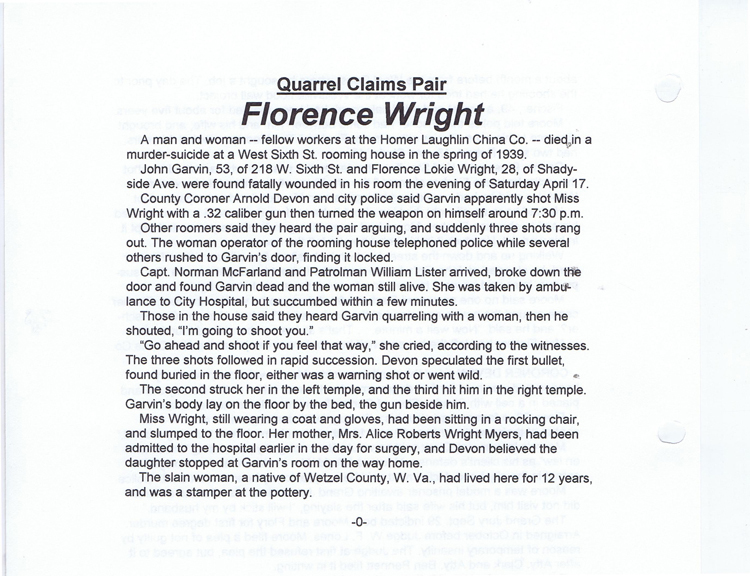 Then she married George Holt of East Liverpool who she said also died a natural death. She then lived with a man for five years as a common law wife, never legally married. He died naturally, she said. After this she married and lived with Harmon at Athens for four years when she learned he was her cousin. She returned to East Liverpool. NEXT SHE WED John F. Ebert of New Cumberland, a sagger washer at the C. C. Thompson pottery where she was working as a ware brusher. Ebert died Nov. 7 the year previous year while they were renting rooms at Newell. He was buried at Locust Hill Cemetery Nov. 8, 1925. Ebert had been treated by Dr. C. R. Campbell of Chester for chest congestion and mumps. The doctor said he believed Ebert was recovering nicely, and told Mrs. Christy he would not need to visit him again. Dr. Campbell said a few days later he was told his patient was dead. Mrs. Christy said she lived with Ebert several years before marrying him, and did so knowing she had a husband in New York, but explained she didn't realize it was against the law. She had first told police she was married only three times, but officers obtained a letter from Ebert's relatives indicating she had a spouse in New York, and she admitted the marriage to cousin Harmon. The new widow told police Christy owned a $300 life insurance policy, but was unsure if she were the beneficiary. He had two sons and two daughters. She said the small package of a yellow powder in her handbag was a rhubarb mixture she took for medicine. Questioning of Mrs. Christy convinced Chief McDermott that she was criminally insane, and had poisoned her husband. He formally filed a first degree murder charge, declaring the woman 'has the brain of a child." His opinion was partly based on her purchasing of clothes and shoes ($50), a bracelet ($3.50), silverware ($10), a trunk ($15), travel bag ($1), necklace, dresses and other things for the Crawford children while her husband was dying in the hospital. "It will not take a lunacy commission long to judge her mentally unbalanced. She should be committed to the state hospital," the Chief told reporters. Meanwhile, police awaited a report on the analysis of Christy's stomach contents, blood and heart, sent to the state chemist at Ohio State University at Columbus. Officers had also discovered the suspect had been wed not five but six times. A local relative reported Mrs. Christy married Charles O'Neill of East Liverpool several years before, and he died about a month later. According to the relative, O'Neill and his bride moved to Cincinnati where he worked as a teamster. The bride wrote to them that O'Neill had died, but when the family went to Cincinnati, they found "Charley" alive. 'We thought the whole affair queer, but Charley's wife seemed to think it was a joke," the relative told police. Two weeks later, word was received that Charley was truly dead, and his body coming back to East Liverpool. Upon arrival here, his widow said he had died of pneumonia. When it was suggested the body undergo a post-mortem examination she 'flew into a rage" and said he had been embalmed. Police asked for more information from George Crawford of Erie St., relatives of Rev. Christy who had asked him to come here early in December. Crawford was in the hospital, ill with a condition caused by his working in the acid pickling department of the National Drawn Steel Co. plant in the East End. HE WAS QUIZZED about a statement reportedly made by Mrs. Christy that she intended "to knock Christy off." Crawford denied hearing such a remark, but said he suspected something was wrong for he knew the woman had been married six or seven times, and most of her men died suddenly or under unusual conditions. Christy's body was claimed by his daughter, Mrs. George Smith of East Akron, and taken to Akron for the funeral. "I didn't want my father to leave us for I had a feeling we would never see him alive again." His last letter to her told of planning to wed the next day, she said. "We never met his wife." Another daughter, Mrs. Sylvia Meshler, and a son, Leroy Christy, also lived in Akron. The second son, Carl Christy, lived in East St. Louis, Mo. Both Sons were licensed ministers with the United Christian Missionary Association. 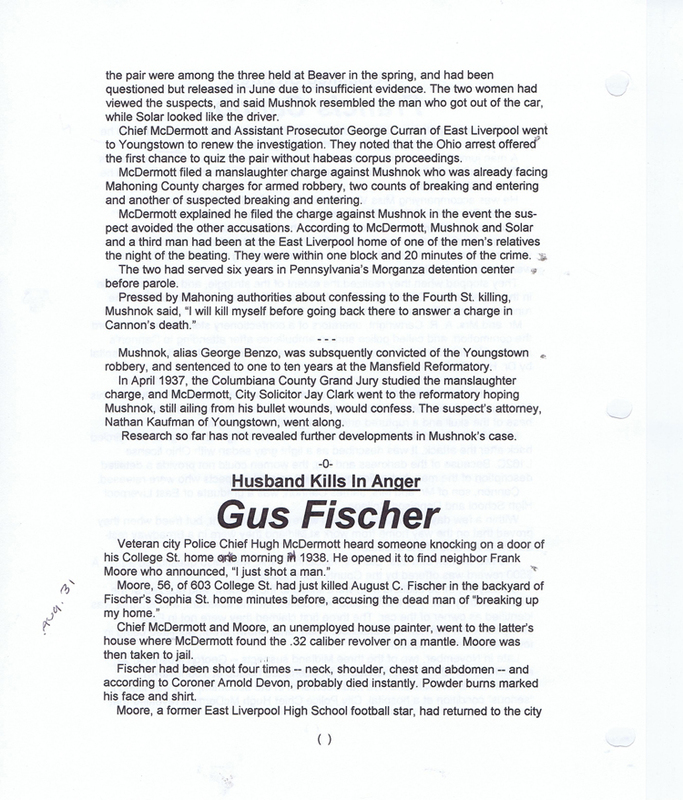 According to materials found in the poison victim's belongings, the UCMA was headquartered in East Akron, with his son, Carl Christy as General-in-Chief; Rev. Christy as brigadier general, and A.M. Christy, another son, as treasurer. Mrs. Christy finally admitted during arraignment before Municipal Judge Jesse Hanley that she had given her husband three doses of arsenic, not baking powder, to relieve indigestion "because he wanted it." She denied she used the poison to kill the minister. She first said she had given it by mistake. Christy had asked her to get a box of prescribed medicine from a cupboard, and she discovered later she picked up the wrong box. Then she admitted she knew it was poison when she gave it to him on the end of a table knife with water, but said he requested it, explaining he had taken it before in small doses and it relieved his pain. She also admitted that she had given him three doses -- not just one at 6 p.m. and another at 10 p.m. but when he first arrived home around 10 am. Chief McDermott, Capt. Conley, a railroad detective and a newspaper reporter searched the Christy's house but found no box of poison she said she had bought previous Saturday to kill rats. She later suggested the box she left on a table may have been knocked to the floor, and burned with papers she had gathered up before leaving. The widow said she bought the poison at a drug store on the Diamond from an "old man." The druggist was brought before her, and she identified him, but he declared he had never seen her. "I haven't sold any arsenic in two months, and I am positive I never sold any to this woman." A brother of Mrs. Christy came into the investigation, asked by police for details on her past. Not identified by officers ("for the sake of his family"), he said he disowned his sister -- she "is just as good as dead to me -- I will engage no attorney. to defend her," he declared. He added another husband to the growing list, saying Laura wed a Steubenville man 12 or 15 years before without obtaining a divorce from a previous spouse. He said she was arrested for bigamy after the legal husband showed up to tell Steubenville police. The brother could not recall the names of the men or the dates. LAURA, HE NOTED, was incorrigible as a child. Her grandparents, Mr. and Mrs.. Moses Bennett, who provided her with a home after their mother's death, tried to teach her to live right but without results. "She would not go to school, would lie, and when she reached 16, left their home. She went from bad to worse, frequenting the lowest dives in town." He said he met her several times and "remonstrated with her but all in vain." There was another sister, Mrs. Anna Mouniford of Minerva, two years younger than Laura, who died some 13 years before, "just the opposite of Laura. We could never understand her. Even in looks she resembled neither me nor her sister." The brother said he was without money to retain a lawyer, and since he practically disowned his sister 25 years ago, he did not believe he should interest himself. "If she has done wrong, she should be punished. I feel sorry for her, but I washed my hands of her years ago." Law officers were now hunting for a possible eighth husband, said to be a resident of California Hollow whom she married several years previous. He reportedly left her after two or three days, suspicious of a strange illness. 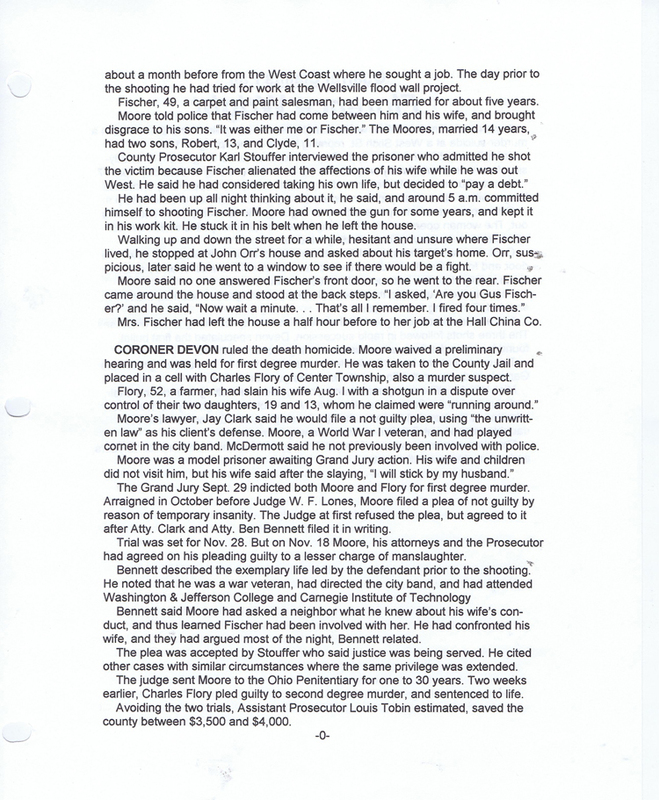 And the law was checking out a report Laura had also married two men while she lived "down river," possibly brothers, one of whom died suddenly. Authorities were unable to confirm another reported marriage to a Newton Falls man. Police continued to elicit additional information from Mrs. Christy who now said she had poisoned Ebert, taking one of the white capsules the doctor had given him, and re-filling it with arsenic. "Because he was mean to me," she explained. 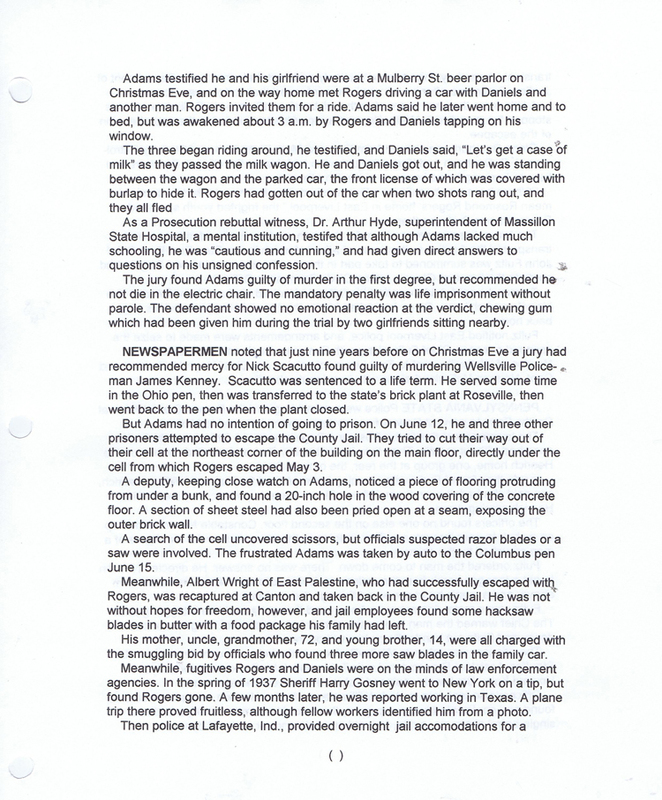 She also disclosed another spouse -- Charles Graham of Dresden Ave., employed at a River Rd. pottery. They were married at Lisbon, but shortly afterward he sent her to visit his relatives at Clarksburg, W. Va. They never lived together after that. Officials said Graham reportedly became violently ill a few days after the marriage, turned suspicious and left her. Sometimes weeping or holding her face in her hands, she told of a sad and lonely early life. Born in Steubenville, she came to the city with her parents when three weeks old. "I was raised in East Liverpool until my mother died when 1 was three. I was taken in charge by 'Coal Oil" Bennett who lived near the old flint mill. I guess he died 15 years ago." She left the Bennetts when 14 "because of their cruel treatment," saying she was once beaten with a barrel stave and knocked under a stove. She denied being sent to a state industrial school, but said she was in the Canton workhouse for a year "for some reason." Records showed she was sent there by city Mayor Charles Brough for disorderly conduct. Laura said she knocked about from place to place, "never had a real home. I didn't know what a kind heart was until coming to the county jail. The Sheriff and his wife have been very good to me. They are the only persons who cared what would become of me." "I was always a black sheep -- that's what they called me." She didn't know where her father was. "The last I heard he was in Hammond, Ind. I haven't seen him in ten years." Mrs. Christy said she had been blind in one eye since she was 8, with impaired vision in the other. She admitted the arrest in Steubenville for bigamy, adding she married Harmon, Ebert and Christy while knowing she was still Graham's wife. She said she was given a paper she believed was a divorce, but didn't know because she couldn't read. A lunacy hearing was authorized, and Dr. C. H. Bailey and Dr. A. J. Michels conferred with her in January for about a half hour behind closed doors in Probate Court at Lisbon. She was evaluated as insane, and Judge Lynn Riddle ordered her committed to the state hospital at Lima. West Virginia authorities had planned to exhume Eberts' body for an autopsy as possible murder victim unless the suspect were found "deranged." With Riddle's order, that move was canceled. Nine months later, a reporter from the Cleveland News interviewed Columbiana County's "woman Bluebeard" and wrote a story claiming state chemists had found no poison in Christy's body. Dan Gallagher, who covered the original murder, also said Dr. Charles E. Clark, superintendent of the state hospital, told him examination revealed Mrs. Christy was feeble-minded but not insane. Gallagher noted her confession was accepted on all sides, but if she had been indicted, the case "would have fallen flat" due to chemists' findings. Mrs. Christy worked in the hospital laundry by day, then was locked up with fully insane women at night, Gallagher wrote. He added Dr. Clark said she should be in home for feeble-minded, not kept with the insane. She told the reporter, "If I can't go free, I'd just as soon be here as in some other institution"
case now. She is of tremendous girth, but looks better than when I interviewed her (at Lisbon) last January." He asked if she would marry again if given her liberty. Well I might if I could find the right kind of man....I still have hopes in that direction. My eyesight is bothering me. I busted my horn-rimmed glasses." "But on the other hand, I feel fine. And I'll look just as nice as ever when I get my new teeth (she had $120 when she arrived at Lima, and planned to use it for dentures). I haven't a tooth in my head right now. I've had them all pulled." She was keeping her hair bobbed "with the view of attracting admirers if ultimately given her freedom," Gallagher reported. Somewhere in county and state archives, yet unsearched, may lie answers to the chemistry test results, to Mrs. Christy's mental status and the many other questions linked to her dark and troubled life. A Walnut St. apartment was the scene of a fatal 1927 stabbing involving a Wellsville man, his friend and a woman whose brother was just convicted of a Salinevilte,2, area murder. Pasquale "Patsy" Anania, 25, was found dead March 22 in the bedroom of the apartment by Dr. A. J. Michels who had been summoned to treat a man who reportedly fell on a butcher knife while cutting meat. In the apartment at 317 Walnut St. were the occupant Salvatore Rini, 27, and his sister-in-law, Mrs. Marie Chorgas, 28, of Minneapolis, Minn.
Rini explained his friend was in the kitchenette preparing a meal when he fell on the knife which penetrated the left side of his chest. Rini was in the hying room, he stated, when Patsy came out bleeding, saying he had "cut himself." To stem the flow of blood and treat the wound, Rini went to a Fifth St. drug store and purchased adhesive tape, peroxide and ointment. He said Patsy had fainted in the bedroom, and had been carried to the bed where Dr. Michels found him fully clothed and very dead shortly after 10 p.m. The physician noted that Patsy was cold, his skin blue and had been dead for an hour or more. Dr. Michels immediately went to the City Hall and notified Patrolman William Lister, and they both returned to the scene. A knife with a broken blade was found in the kitchen, and a bloody overcoat in the backyard. Bloody rags were found, but no evidence of a struggle. RINI HAD RENTED the apartment at the rear of the Euclid Hotel about three weeks before. Mrs. Chorgas, a sister of Rini's wife, had come from Minnesota a month or so previous to attend the trial of her brother, Roy Wallen, who was sentenced to life in prison for killing Rodney Ogle, a neighbor, near Salineville. She had been staying at the Rini home. Her husband, James, operated at confectionery in Minneapolis. It was said that Rini's wife, "Babe," went to Covington, Ky., the Sunday before with her mother. Patsy, son of Mr. and Mrs. Ralph Anania of Commerce St., Wellsville, was known in Wellsville and East Liverpool. He had quit high school in 1919 three months before graduation. Mrs. Chorgas and Rini denied there had been a quarrel earlier in the evening, as police believed, explaining the "accident" happened while a meal was being prepared around 5 p.m.
Police claimed Rini had been charged the previous summer with stabbing another man at Thompson Park during a quarrel in which Anania was involved, But Rini was fined only on a minor charge when the prosecution witness failed to appear. Rini and Mrs. Chorgas were jailed on a charge of first degree murder. At a March 24 hearing before Acting Judge Ben Bennett, Dr. Charles Bailey testified the butcher knife could not have caused the wound which had a narrow opening and extended deep into the left ventricle. Both were held for the Grand Jury which on April 14 indicted them for second degree murder. They pleaded not guilty at arraignment five days later. Trial began May 2 before Judge W. L. Lones with Prosecutor Robert Brookes for the state, Atty. W. A. O'Grady representing Rini and Atty. S. W. Crawford serving Mrs. Chorgas. A surprise Prosecution witness was Fred Rockmaster, Pittsburgh chemist, who testified the blood and lint on the alleged murder weapon, a penknife, matched that on Anania's coat found in the backyard. RIM'S 'ACCIDENT' claim was further shaken when Mrs. Chorgas became the key Prosecution witness, despite the argument by O'Grady that a co-defendant could not testify against another. Mrs. Chorgas, however, waived her rights as a defend-ant, and denied that the Prosecution had promised her immunity. She said there was no quarrel the night of the slaying, but she had spoken with the dying Anania, and when asked, "Who did this?" he replied, "Sal did it." Rini had gone uptown to get eggs and meat for their evening meal, and on returning, said the eggs had been broken in his coat pocket. "The Greek did it on coming out," he told Anania. Mrs. Chorgas said Rini removed the eggs from his pocket along with penknife on which some of the mess had stuck. Patsy laughed, angering Rini. When Rini asked who would cut the meat, Patsy said, "You." But Rini refused, saying he was sick, and walking into the bedroom to lie down. Patsy later went out to buy cigarettes. When he came back, Mrs. Chorgas asked him to cut the meat, and she sat in the living room reading a magazine. Then Patsy came to the doorway holding his chest. "Look, Marie, at what I've done." She pulled his hand away, saw the blood and placed a cold towel on the wound, telling Rini to get a doctor. Instead, he went to the Hodson Drug Store and obtained adhesive tape and peroxide, returning to treat the wound. Rini talked to Patsy, she said, but he wouldn't answer. Later he turned to her and said, "Marie, I'm cut." She asked, "Who did it?" He answered, "Sal did it." "Good God, man, you're my pal," Rini exclaimed, according to Mrs. Chorgas who said she gave Rini $10 and told him to get a doctor. He took her by the shoulder, she said, and asked, "Did you see me do it?" When she said, "No," he let go. After Patsy went to the bathroom, Mrs. Chorgas said she picked up the knife from the kitchen floor, broke the blade and threw it out the window, telling Prosecutor Brookes she was afraid of it. '1 saw the cut in Patsy." Late in the kitchen, Rini looked unsuccessfully for the knife. She told him she was going to go home, and he said she could go. He placed his hand on her shoulder, and asked where the knife was. When she tried to push him away, he warned her not to "squawk," and cut a line on her wrist. 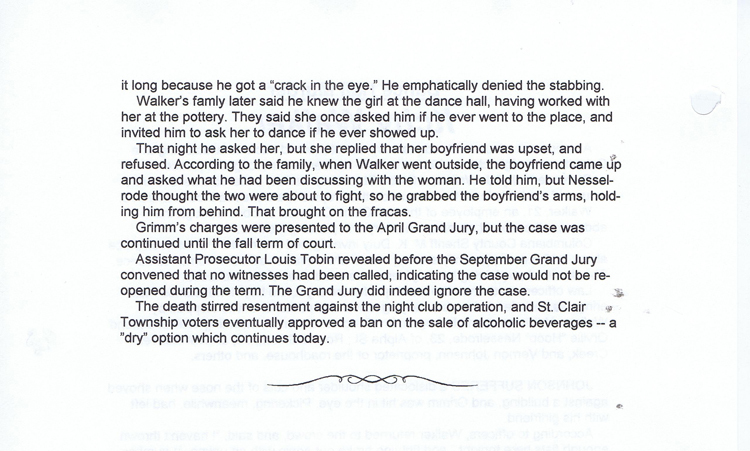 Why, Brookes asked her, had she not told this story to the police and the Grand Jury. She replied she was afraid not to repeat what Rini had told her. Her account was contradicted by Rini when he took the stand, he denying Anania said, "Sal did it" or he had cut her wrist. He had no knowledge of what happened, he declared, until Marie and Patsy came to the doorway of the bedroom and she said, "Look at what Patsy has done." The wound, he stated, did not bleed much; "I thought he was more drunk than hurt." Rini testified he and Patsy visited Mrs. Chorgas and her sister when they rer* ed on Sixth St. and Fourth St and they all "drank and laughed about every night. While he and Patsy were in the bathroom, the defendant said Patsy told him, "Marie hurt me." The Review reported his "sordid story," about happenings in the apartment and his allegation of intimate relations between Patsy and Marie. In the large courtroom crowd were many young women and girls along with the entire senior class of Salineville High School. THE DEFENSE hinted at suicide as the cause of death. 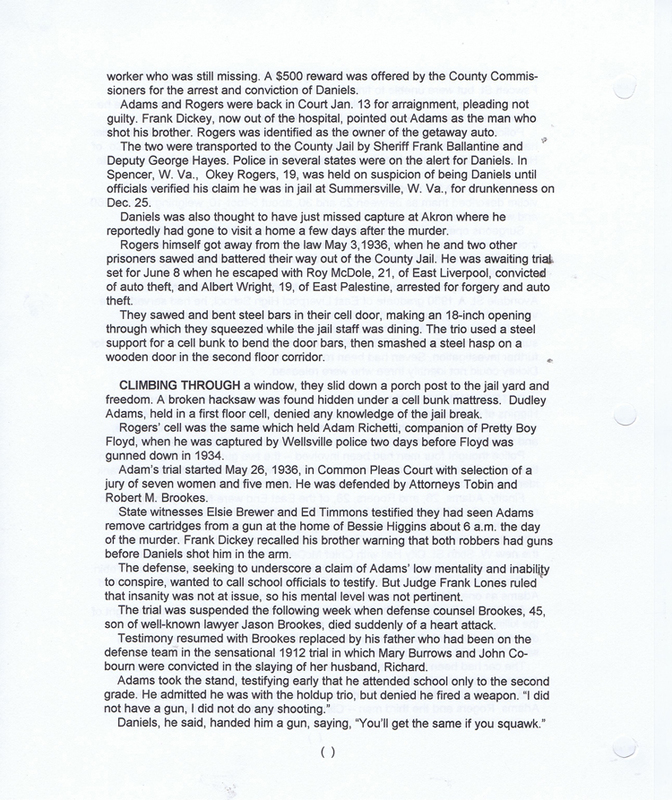 But Dr. Bailey was called by the Prosecution to testify he had never seen a self-inflicted wound such as Patsy's. In closing argument the defense declared Rini had no part in the killing, that he was in another room and that Mrs. Chorgas had done it. 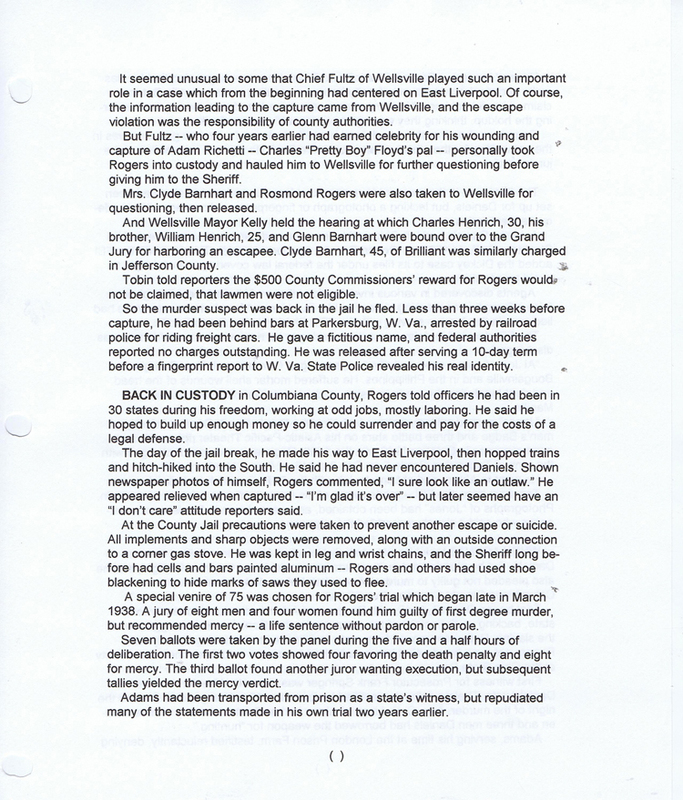 Prosecutor Brookes urged the jury to acquit Mrs. Chorgas of any connection with the crime, but appealed them to convict Rini. That they did, returning the acquittal and guilty verdicts in five hours and 15 minutes on Saturday May 7 after 16 ballots. The panel reached agreement on her innocence in two ballots, and afterward she walked to the jury box with tears in her eyes and thanked them. Rini's mother wept as she went to his side to comfort him. Judge Lanes rejected a motion for a new trial, noting that a crime had been committed, and that Rini was a husky young man who could have driven the knife home in a way a woman could not. He sentenced the defendant to life in prison. An East End landlady died in 1931 when shot by a boarder who then fatally wounded himself after an argument over her ordering him to leave. Mrs. Hannah Allison, 50, of 429 Elm St., wife of a streetcar motorman, was struck July 6, by one of five .32 caliber bullets fired by Henry Barnett, 60. 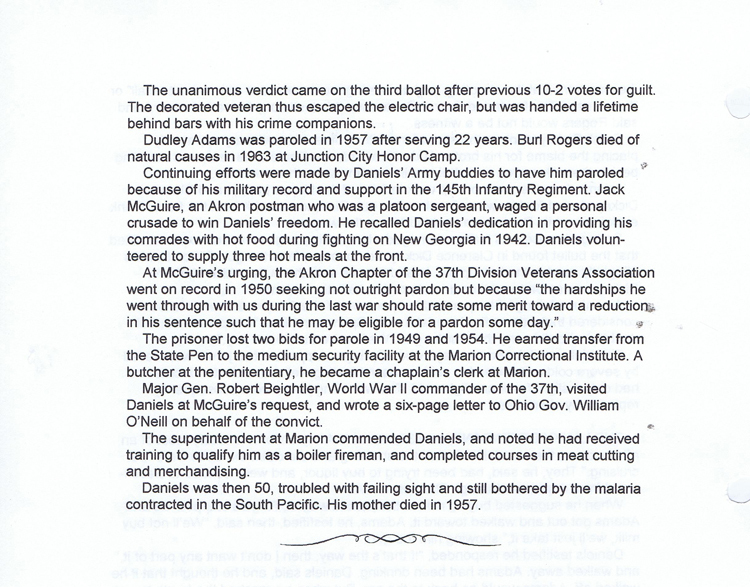 Barnett fired the last shot into his mouth, the bullet exiting the top of his head. Mrs. Allison was descending from the second floor to answer a phone call when hit by the first shot, falling dead at the foot of the stairway. A second shot aimed at her went wild, and two more were fired at David Skilling, 18, another boarder who had called Mrs. Allison to the phone. Uninjured, Skilling, a miliworker, fled through a rear door and summoned police. He said Barnett and a woman companion were ordered by the victim to leave the home the night before. Barnett returned the next morning to get his clothes, and a quarrel between the two followed in an upstairs room. When Mrs. Allison started downstairs to answer the call from a daughter, she was shot in the base of the brain. Barnett was taken to City Hospital where Dr. Charles Bailey predicted he would not live. Barnett died later that day. iIn order to speed things up we are going to photograph each page iand offer it as a photograph nstead if the former way of doing it in text form. Since there are pictures in this one we will go back to the text format for it. An Avondale St. man walking his dog along Jennings Ave. in late October 1940 made a gruesome early morning discovery -- a woman's body jammed inside a barrel lying just off the road-way. Her killer was never punished, although the prime suspect was placed on trial with strong circumstantial evidence but was acquitted. 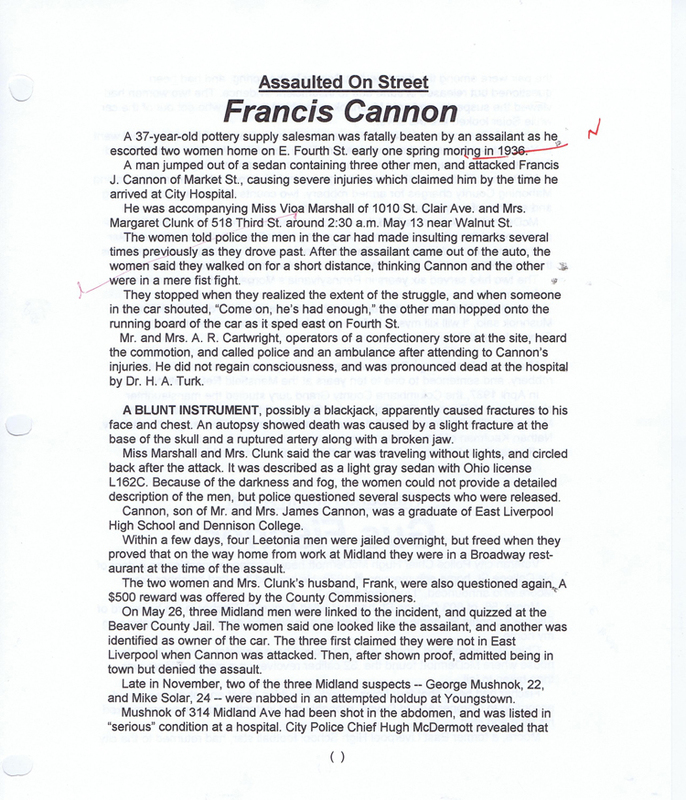 The case drew wide area attention as the "Barrel Murder." Mrs. Julia Jordan Wall, 46, had been stuffed into the wooden container jack-knife fashion, and apparently tossed from a vehicle near St. Clair Ave.
Harvey Cullen noticed the barrel around 7:30 a.m. Oct. 29, a Tuesday, and telephoned police. He told officers that shortly after his discovery a parked "purplish" colored sedan with out-of-state plates left the area and turned onto St. Clair. Bluish blotches on the victim's face led police to believe she had been strangled. There were no marks of violence, and no indication of sexual assault. Wrapped in a burlap bag, the body, with the legs and feet protruding, was com-pressed so tightly the barrel's hoops had to be knocked off before the victim could be freed. Death occurred not long before, since rigor mortis had not set in, and the barrel was dry although rain had fallen about 6 a.m. THE WOMAN, NOT immediately identified, was clad in a deep red dress and belt trimmed with gold ornaments, silk stockings and an imitation black Persian lamb coat. Around the neck was a fine linked chain with a small cross set with imitation stones. She wore no rings. The barrel had apparently been used to store potatoes. On the burlap bag was the label of a California walnut company. Before the day was over, the victim was identified through cleaner's marks on the clothing. It was also learned that she had been married only four days before and had worked for a city produce dealer who was reportedly jealous. That was enough for officers to wait outside the E. Second St. apartment of Frank Cascio and arrest him as he drove up in his produce truck. Wall said his wife had departed their home around 3 p.m. Monday for East Liverpool to pick up a pair of spectacles left at a store for repair. She carried in her purse his flashlight, explaining "it may be dark before I get home." Between 3:50 and 4:30 p.m. she was downtown with her daughter, Mary Catherine Jordan, 16, of Maplewood Ave., a high school sophomore. They shopped at three department stores, and Mrs. Wall bought the girl a pair of shoes. The two separated at Ogilvie's store where the mother was purchasing curtains. Mary Catherine listed three articles Mrs. Wall was wearing but not found later -- a black felt hat, black shoes and a brown, zippered purse. The mother apparently intended to return to Smiths Ferry, telling the girl she would have "just enough change to take me home on the bus." Wall told police Cascio had threatened his wife several times, telephoning and asking for money. He said the produce dealer claimed she "had been his woman for two years," and came to their home the previous Friday asking for money. After taken into custody, Cascio, a thick-bodied, native-born Italian, was trans-ported to City Hall where Police Chief Hugh McDermott filed a suspicious person charge. Questioned intensely by city and county authorities, Cascio, 55, denied the slaying, and provided a detailed account of his whereabouts from Monday after-noon until Tuesday morning. In a money pouch Cascio carried was a gold wedding band Wall said was his wife's. Mary Catherine also identified it, adding she had worn it herself when younger. Her mother kept it in a change purse, and wore another wedding ring and engagement band Monday. Police said the home showed no signs of a struggle. A button matching the vic-tim's coat was found, but the coat did not have any missing. Some dresses and a hat were also found along with an earring and hairpin, but not linked to Mrs. Wall. 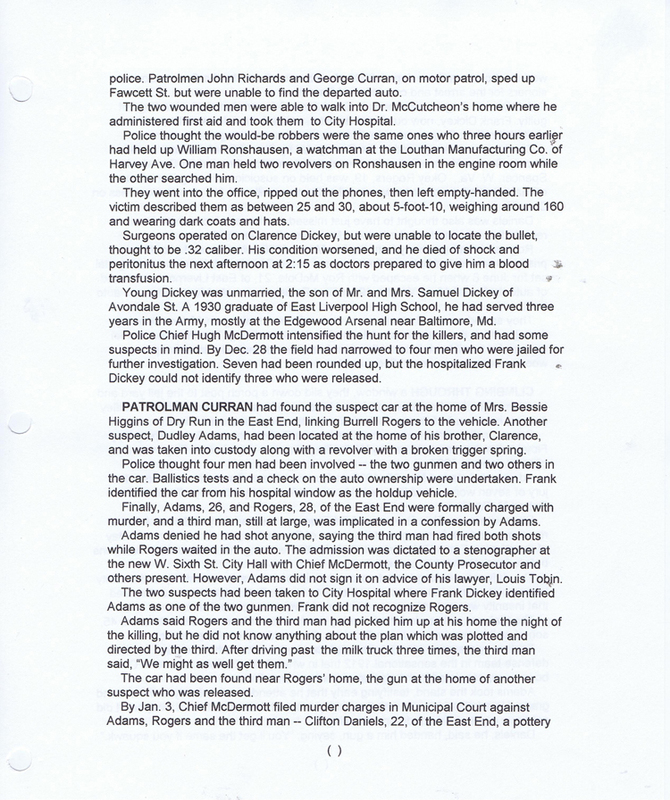 WITH SUCH EVIDENCE, Chief McDermott filed a murder charge in Municipal Court, and a preliminary hearing was held before Judge Frank Grosshans. Dr. Frank Harrison, city health commissioner, provided surprise in reporting that no strangulation marks were on the victim's neck, and she died from lack of oxygen because her breathing had been shut off. The doctor also noted the body had been embalmed before the autopsy, and the embalming fluid could have caused some changes in the internal organs. Atty. John Bauknecht of East Palestine, retained by Cascio, contended that she would have struggled with her killer, leaving some marks. He had asked the phys-ician to examine the suspect, and Harrison reported a small abrasion behind his right ear and another on the shoulder. Cascio told the doctor the first was caused by a barbers slip during a recent haircut, but did not explain the other. The most convincing Prosecution witness was Charles Harris of 1047 St. Clair Ave. who had known Cascio for more than 20 years. City Solicitor Carroll Lynch asked if the suspect had mentioned anything about his relationship with Mrs. Wall. Harris quoted him saying Monday afternoon, "She has double-crossed me. I feel like killing her. "Harris said he told Cascio, "Forget about it. Go find yourself another woman; there's lots of them around." This brought a laugh in the courtroom, and the Judge gaveled for order, reminding all "This is serious business." After the two-day hearing, Judge Grosshans bound Cascio over to the County Grand Jury. The recalled September Grand Jury studied the case along with several others when it met in December. 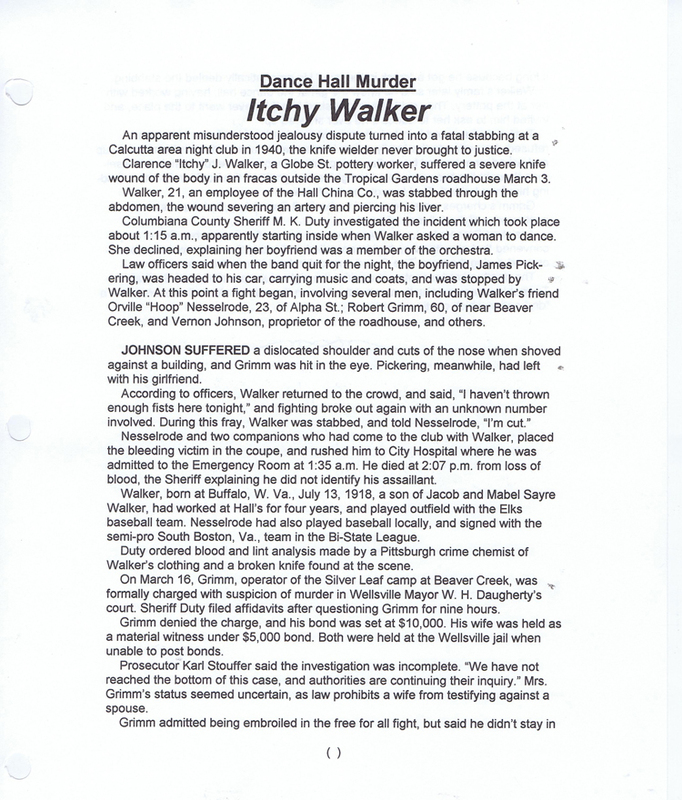 An indictment of first degree murder was returned against him. Another sensational case came before the panel -- the severe Dec. 12 wounding of Mrs. Sylvia Anderson on the porch of an East End home by James Bunfield of Vanport, her lover. Bunfield, formerly of East Liverpool, shot Mrs. Anderson, 35, because she was leaving him to return to her husband after four years. In an effort "to see her one last time," he went to visit her at her brother-in-law's house on Monaca St. He asked her to step out on the porch, and when she did, he placed his gun against her head and pulled the trigger. He fled, going first to Newell where he told his wife at the Homer Laughin China Co. what he had done. Then he hid down in the Congo area, to wait for a friend who was to let him know whether Mrs. Anderson had died. Police learned of his whereabouts, and city officers with Chester police and Hancock County Sheriff deputies closed in around dusk, capturing him. "I didn't mean to kill her," he told them, "I just wanted to mark her for life." Bunfield, an employee of Crucible Steel, had previously served two terms in the Ohio State Penitentiary -- once for house looting and again for car theft. The victim remained in "critical" condition for several days at City Hospital, and the Grand Jury indicted him for shooting with intent to wound or kill. FRANK CASCIO went on trial Feb. 10, 1941, with a new legal scenario facing him. Frank Springer of East Palestine was now County Prosecutor, elected in Nov-ember to replace the previous Prosecutor Karl Stouffer. Judge Joel H. Sharp of Salem had begun duties in Common Pleas Court, elected to succeed Judge Frank Lones who retired. Atty. Bauknecht was now assisted in defense by Atty. Francis Lang of East Liverpool. But more than personalities had changed. The Prosecution had suffered major setbacks in its case against Cascio. Christopher Wall, a key witness regarding the flashlight and his wife's ring, had died Feb. 1 at a Buffalo, N.Y., hospital of heart problems. He had narrowly escaped death in December after suffering a stroke and falling against a gas stove, causing the heater to burn high and filling his Smiths Ferry home with fumes. Patrolman George Kidder, the desk man who identified the flash light and ring in Cascio's possession, had also died in the meantime. Mrs. Lucy Lillie of Pink Alley, another witness who said she saw Mrs. Wall enter Cascio's apartment, was killed in a December traffic accident near Toronto. So Municipal Court clerk Mary Toland read her stenographic account, bringing the accusing words of the husband and policeman to the jury of five men and seven women -- middle-aged farmers, housewives, a businessman and others. Harvey Cullen went to the stand, describing how he took his dog out to "raise rabbits," stopped when the dog refused to approach a thicket. He checked and found the barrel about two feet off the cinder roadway and close to the edge of a steep drop into a hollow. Kicking at the wooden barrel, Cullen was startled when the burlap opened to disclose the body. He hurried to a neighboring home and summoned police. As he returned to the site, he noticed a parked auto start up and head onto St. Clair Ave. He could not read the license, but it appeared out-of-state -- Pennsylvania or West Virginia. Mary Catherine Jordan described the ring found by police, saying she recognized it from a mark where it was cut to fit her finger when she wore it two years before. Telling testimony came from Willie Ward who lived in a Second St. apartment opposite Cascio's. He said he saw Mrs. Wall enter her former employer's doorway around 4 p.m. the day before the body was found. He recalled the time as close to when the quitting whistle sounded at a nearby factory. Ward didn't see her leave, he told Springer. The Prosecutor focused on the basic elements previously outlined in the pre-liminary hearing, centering on the time of death between 5 and 8:30 the night before, and the woman's presence at Cascio's apartment. Judge Sharp, new to the bench, was caught up in the challenge of legal technicalities. His wife telephoned the Sheriff one evening to report her husband has-not yet come home, and asked if deputies could locate him. A deputy found him in his chambers, engrossed in law books. "What time is it? "he asked. Told it was 2:20 a.m., the surprised jurist remarked, "Gosh, I haven't had dinner yet!" and departed. After the state concluded its case with some 30 witnesses, Bauknecht moved for a directed verdict of acquittal. He declared the state had failed to provide any positive evidence linking his client. THERE WAS NO proof, he noted, of how Mrs. Wall was killed or even if the crime occurred in this county. But Judge Sharp refused to dismiss, and the defense presented its case with 13 witnesses and testimony refuting the State's claims. G. R. Pattison, a city jeweler, said the wedding ring had not been cut down to fit, since the line was not near the 14K mark as it would have customarily been. Atty. 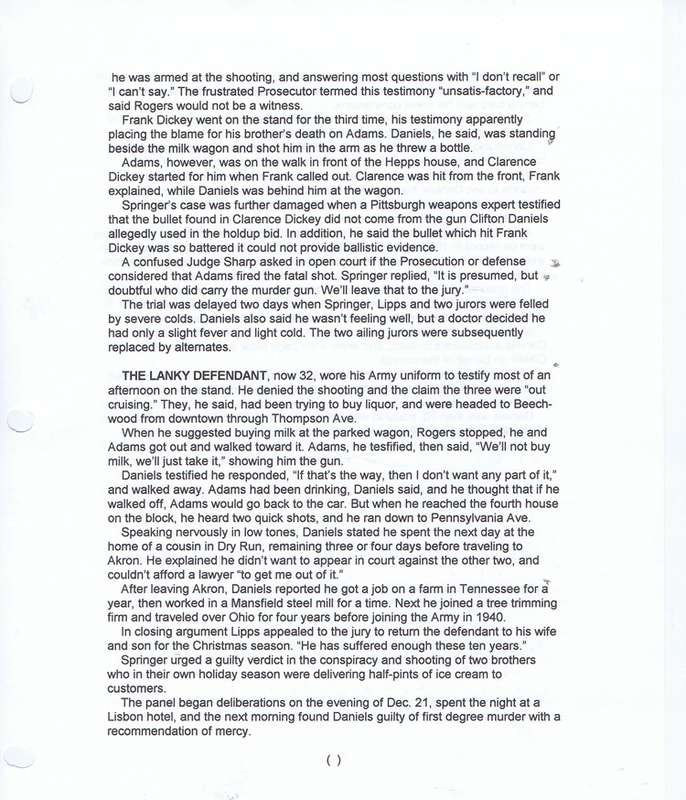 Lang took the stand to read a statement he obtained from Willie Ward who testified he saw Mrs. Wall enter Cascio's apartment shortly before 4 p.m. Lang noted several witnesses testified seeing Mrs. Wall and her daughter shopping uptown at 3:50 p.m.
Four Valley Motor Transit bus drivers testified about passing along Jennings Ave. and not seeing any barrel until they noted police at the site after 7:30 a.m.
Mrs. Bessie Horton of 220 E. Second St., a neighbor of Cascio's, said she saw him leave his apartment around 7:50 a.m., walk to Washington St. and head up the hill, stopping to light his pipe. But other witnesses placed Cascio at the City Market at 7:15 a.m.
Frank Wells, produce manager at the market, said Cascio was there with his parked truck when Wells arrived at that time. Fred Huston, a grocer, said He saw Cascio there when he came to buy supplies. Despite strong objections from the Prosecution, Bauknecht introduced hearsay evidence that Mrs. Wall had been seen "quarreling in the streets" with her husband at 3 a.m. the day the body was found. Mrs. Jessie Heath of the Ceramic Hotel testified a man told her of seeing the pair arguing. She reported it to Chief McDer-mott who doubted the credibility because the man was believed intoxicated. Cascio himself went on the stand to deny he had anything to do with the woman's death. He traced his movements the night before Cullen discovered the barrel, and identified the flashlight and the ring as his own. He kept the flashlight under his pillow, he explained, because the apartment lacked electricity, and he needed it during the night. The ring, he explained, was part payment of a grocery bill receive when he was in business at Toronto. He had given it to his second wife, Blanche, and she had taken to Steubenville to have it fitted. Since her death several years before, he had carried it in his change purse. As to his relations with the murdered woman, he testified she had come to work for him when he operated a store. "I couldn't afford to pay her very much. She said she had been kicked out, so I agreed to pay her $10 a week and board." "She had been living in a room on West Sixth St., and I had been staying with my brother, so I rented the three-room apartment. She stayed there for three months until I had to close up the store, and then she went out to do housework." The short, stocky witness testified, "She didn't stay there continually, but would be away for two or three weeks, then come back, then go away again." He said he learned of her final employment from two women he overheard passing his truck. "From the remarks, I became suspicious. They didn't say it was a very good place." HE SAID HE went to Smiths Ferry and gave her $15 he owed on a note at the First National Bank. Her name was on the note. Asked about phone calls he made to her a few days before the death, he said he was about to give up the apartment, and wanted to know what she would do with furniture she bought. Cascio was grilled fiercely by Prosecutor Springer who claimed he had told the victim's sister he would marry Julia if she would come back to him. He denied that along with a suggestion he had not spent the night in his apartment. Springer, seeking to convince the jury the murder had occurred earlier in the apartment, charged, "You put her on the bed and held something over her mouth and nose so that she could not breathe or scream, and then put the body in a barrel, hauling it to the ravine out in the residential district where her own brother lived, and there rolled it from your truck." Casio, visibly shaken, replied, "No, no, Mr. Springer!" In Bauknecht's closing arguments to the jury he declared the State had not one "shred of evidence" linking Cascio to the killing. There was no indication that the body had been left on Jennings Ave. before 7:22 am., he said, noting the lack of rigor mortis. He noted from Cullen's testimony that it appeared the body in the barrel had been thrown in haste from an auto that morning, and had failed to roll down into the ravine. The driver had stopped and waited nearby to push it over, and left when Cullen came along. He also scored the "slipshod investigation" in which the body was embalmed before the autopsy, and the stomach contents not examined. Bauknecht said the victim was not with the defendant that night, pointing out she was completely clothed. "No woman who went to a man's apartment and stayed until 4 would have been dressed fully. And no man ever dressed that woman as a corpse." Judge Sharp explained to the jury it had five verdicts to consider -- guilt in the first degree with mandatory execution, first degree with recommendation of mercy, second degree, manslaughter or acquittal. During its five hours of deliberation, the panel held three votes. The first was nine to two for not guilty with one not voting, the second was ten to two for not guilty, and the third a unanimous acquittal. A beaming Cascio was surrounded and embraced by happy, tearful relatives. The Judge told him, "This releases you. You may go home now." Cascio, held in jail for three months, said humbly, "Thank you, judge," and shook hands gratefully with each of the jurors. Springer, who had taken over the case only weeks before, had no public comments on the outcome of his very first trial as Prosecutor. Few followers of any murder trial -- fully understand the stress placed upon the attorneys, both for the state and the defense. Lawyers for the accused especially realize a human life rests in their skills, their expertise, their complete commitment to the cause. And much study and review of the law are demanded. The family of Francis Lang recalled for me the long hours and tremendous pressure he endured during this case. In fact, Mrs. Lang afterward made him sit down and sign a statement that he would never again serve in a capital punishment case. He didn't. And the death of the three-week bride remained unsolved, as it is today.